Adelaide is quite often overlooked when businesses are looking for a CBD location for their new business however it is a perfect place to locate your new venture. Staff costs are lower in Adelaide, the transport system works effectively and it is a vibrant CBD for startups. Unfortunately, if you want to go the traditional route with a physical office it can cost you $300 per square metre or more for an A grade office. Try us out with no cost to you. We are convinced that once you see how easy our system is to use you will be here to stay. Test us out for 2 months at half price. What do you have to lose? 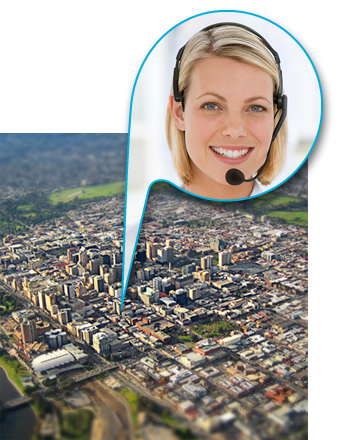 Rather than setting up a physical office location in the Adelaide CBD you could opt for a virtual address with VirtualReception.com.au. With the physical address you will have to outlay a whole load of expensive bonds and deposits, while with a mailing address you simply pay month to month. It really does make great financial sense for your business. When you start a small business you need a reasonable amount of capital. Unfortunately, for the majority of people starting small businesses that capital can be quite limited. Many people try to juggle loans and credit cards to make their small business work. With this in mind, it makes sense to pay only 2-3% of the rent cost to secure a brilliant CBD based address for your business. So Why should I go Virtual? There are lots of reasons. Here are some of the key ones. It works out significantly cheaper. As I mentioned above, you weekly rent will be only 2-3% of the cost of a physical location. In addition, you don't need to pay out 6-8 weeks in bond, you don't need to buy flashy furniture and you don't pay for utilities. You are free to work from wherever you want. If it's a nice day you can head down to the beach and work from a cafe or in winter you can head up to the mountains and work next to an open fire. You are totally flexible. Your startup business will look bigger than it actually is. People are impressed by CBD offices and your customers will see that you mean business. If you need to meet with your customers you can rent a meeting room or meet in a local cafe. You don't have to settle for just one location. We have virtual addresses in 48 locations throughout Australia. You can have your head office located in Adelaide while having branch offices in all major capital cities. All for a very reasonable cost. What does an average customer look like? Generally our customers are organisations with anything from 1 to 20 staff. A lot are involved in some sort of consulting (ie, lawyers, accountants, tax professionals) and generally head out to meet with their customers rather than the customer coming to them. Whereabouts are your locations in Adelaide? Our Adelaide virtual offices are located in Pirie Street which is in the heart of the CBD not too far from Rundle Mall. We also have mailing address locations in all major capital cities around Australia. Why not go national and set up a few addresses! Now that you have your virtual office maybe you should consider getting a telephone answering service and go totally virtual. You can save a significant amount on the cost of having an inhouse receptionist and our service is exceptional. You can give our friendly sales support staff a call on 1300 893 820 a call and they will be happy to help.